Tonight is the night. Many of my artsy friends are participating in Cleveland Public Theatre's Annual PANDEMONIUM benefit, including several actor-teachers. My production will happen in the Parish Hall at 7:45, 8:20 and 8:55. 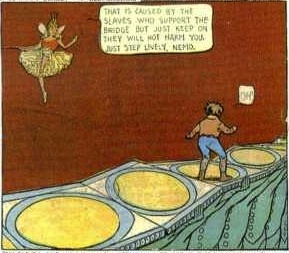 Here are a few sample panels from Winsor McCay's original strip that we incorporated into our brief tale. 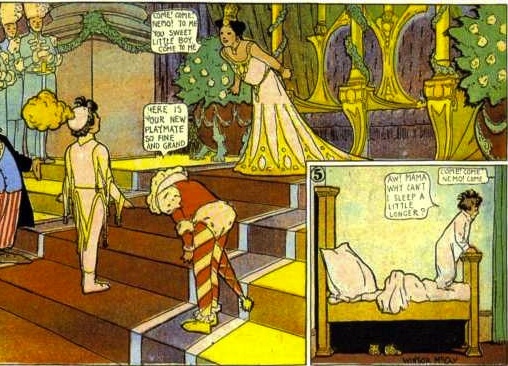 During the first several months of publication (1905) Little Nemo In Slumberland was almost entirely about the continuing, fruitless attempts to get Nemo to Slumberland to be the playmate for the Princess. The character of Flip acted as a kind of nemesis, intentionally waking Nemo up before he could reach his destination. 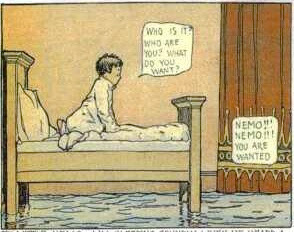 In short time, however, he became a kindred spirit for Nemo, and a companion. 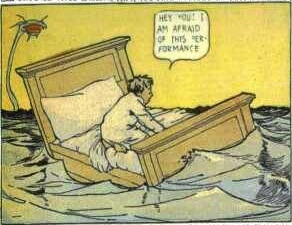 This evening's performance embodies the fears and anxieties present in those first few months of publication, and Flip remains an adversary. 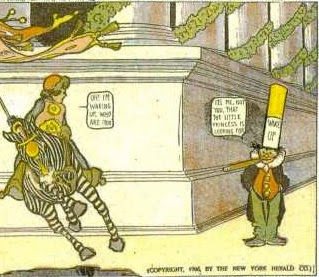 He is played by Al.